“Tigers re supposed to run fast” she screamed leaning over the barrier. “Raarrrgggghhhh” I replied baring my teeth. How the hell are you supposed to explain to a 7 year old whilst running at 13 miles per hour that you’re a little bit tired and a little bit hot after running 9.5 kilometers in a tiger suit. A tiger suit made out of polyester fur might I add and about two size too small for me. Oh and did I mention I had my face painted like a tiger too? So what’s with the tiger stuff you might ask? Well about two weeks ago I was contacted by the Tiger Balm 2014 “Born to run” team and asked if I would like to run the British 10K Race in Central London. Now I have run this race a few times before, in fact this was my first 10K race about 8 years ago so I jumped at the chance. 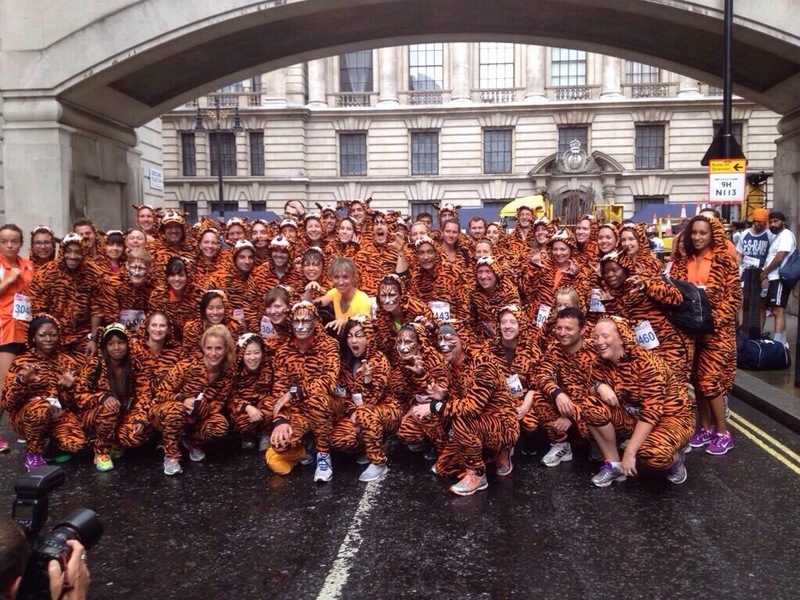 It was only when I read the small print that I realised we would be running tiger suits as part of the 150 strong Tiger Balm ‘Born to Run’ team, headed up by Michaela Strachan to raise money and awareness for the Born Free Foundation, specifically the plight of the tiger and the illegal trade of animal parts. www.facebook.com/TigerBalmUK . It is estimated that approximately 3,500 wild tigers remain in the world, and numbers of this iconic species are continuing to decrease. The main threats to wild tigers include: habitat loss and fragmentation due to mining, logging, farming and human settlement; depletion of their prey; conflict with humans; and poaching for their skins and other parts and products. In all honesty I am not the worlds greatest wildlife activist, but I do have a bit of prior when it comes to tigers as I was chased by one at the Brighton Marathon not too long ago!! I had no reason not to get involved and hey I would get to meet Michaela Strachan so I enquired about the size of the onsie tiger suit we were to wear and was told there would be one in my size and that we would have the option to run in a t-shirt anyway…I was in, but I was still a little concerned. We had to be on site for 7.30 which was a struggle I can tell you, but it wasn’t long before we were all in our onsies and taking a group photo. the onsie was tight to say the least and not just because of my weight, my height played a part too…they only had Large technical shirts to run in as an alternative and it was too tight and too short for me so the tiger suit seemed like the less of two evils. I even had my face painted a decision I would later regret. As I walked to the start line along with 25,000 other runners I remembered why I had enjoyed this race in the past. The route takes in The Ritz, St. James’ Palace, Trafalgar Square, the magnificent St. Paul’s Cathedral, the unique London Eye, the world’s most famous clock Big Ben, the British Houses of Parliament, the historic Westminster Abbey before finishing on Whitehall at the junction of Royal Horse Guards and Banqueting House after passing Downing Street and The Cenotaph…for anyone wanting the chance to run in London this is the race for you, and as a born and bred Londoner even I feel quite chuffed to be running it. After a little light rain the race started and I made a conscious effort to go slow. It didnt take long for the heat of the suit to be felt. I would say by the first kilometre I was starting to regret the whole idea. My the 2nd my tiger face was starting to drip into my eyes and I felt like steam was actually coming out of the zipped area near my chest. The crowd support was great, especially for us Tigers so I just kept plodding along. I walked at the water stations and on a few of the hills but other than that I was covering the course in a reasonable time running the first 5k in 33 minutes or so, not PB times but considering the conditions pretty swift. At about 7K whilst taking a quick walk break I was overtaken by Michaela and a guy who I guess was the CEO of tiger balm. I started running again and ran about a kilometer with them, working off the cheers she was getting along the way. 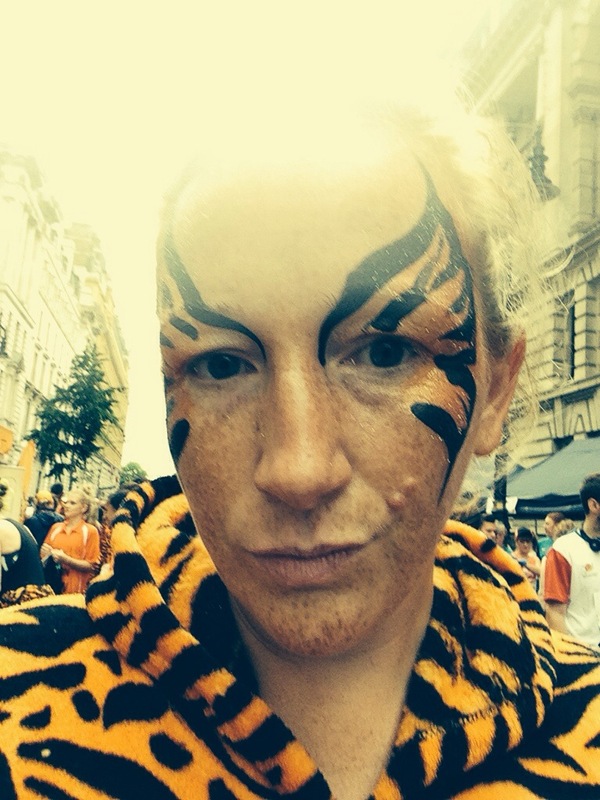 It felt strange in some ways not to have my @fattymustrun name anywhere on me, and my tiger disguise made it impossible for any of my followers to recognise it…I wasn’t quite sure how I felt about running so anonymously on the eve of my new website launch. As we approached the Houses of Parliament I took another walk break and prepared myself for Westminster Bridge and the crowds. I knew now I was on the home straight. 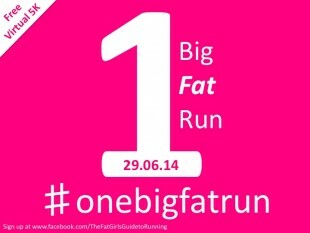 I was nowhere near my PB of just over an hour but in all honesty I was just chuffed that I had got round in one piece. By now I knew I looked an absolute state, I had been running with my sports bra exposed for the last few kilometers in an attempt to cool down, my hair was drenched and my tiger stripes on my face running down my neck, the glitter was pooling in the corner of my eyes giving me double vision but I didnt care as I only had 700 meters to go…thats when I heard it. This tiger had nothing left in her legs to run fast, but she did have just enough in the tank to give a roar and accompanying mauling action, enough to make the 3 small children and their parents laugh. 300 meters to go and the announcer welcomed in yet another tiger. I crossed the line in about 1 hour 17, collected my medal and then stumbled home on the tube much to the amusement of the rest of London. My eyes are still stinging from the whole face paint fiasco, and I am a little tired but other than that I feel grrrreeeeeaaaaattt. I did learn a thing or two though namely that running in face paints is never a good idea, Running in fur is not wise either, however Running just for fun is a great way to remind you of why you do it in the first place. Oh my gosh I am impressed – you make me feel even worse about the 10k I dropped out of at 5k on Saturday – too hot, I hurt, I couldn’t breath – all the usual excuses but the first time I had ever not finished a run. And then you do this! Jolly well done! !